If you think the key to Arnold Schwarzenegger's success in bodybuilding was genetics, you're wrong. Very wrong. Stop worrying about your genes and focus on maximizing your potential! We all have 23 pairs of chromosomes that identify us as human, and within those chromosomes are small variations that make each person unique. But do these differing codes that make us individuals also determine or limit our physical capacity? That's not how I view my potential or yours. I think the limiting factor for success in developing your physique is your dedication and discipline. Arnold Schwarzenegger at his peak is widely recognized as the pinnacle of human achievement for physical prowess and muscularity. Sure, subsequent Mr. Olympia winners and other bodybuilding champions have carried more mass, but The Oak remains the gold standard for what many of us aspire to. Some people attribute his success to his genetics, but I disagree. There were likely dozens or hundreds of young guys who had the same potential as Arnold, but they never took advantage of their God-given gifts. You may not have the genetics to look exactly like Arnold, but that doesn't mean you can't fulfill your own potential. I plan my training and diet with thoughtful precision. I rarely miss a meal or skip a workout. I can't remember the last time I entered a McDonald's to do anything other than McPee. In short, I strive to master all the variables I can control to further my success, which leaves just a few that aren't within my grasp—such as genetics. No matter how hard you lift, your genetic structure (including your response to progressive resistance training) was determined before you were born, like some prenatal lottery. 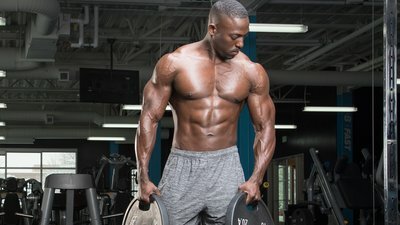 This partially explains why some new lifters can gain 30 pounds in a year, and virtually all of it muscle, while others struggle to add that much in their entire lifting history. You may have tried to emulate Arnold's training and diet regimen, hoping to achieve the same results he attained with his physique, but most of us will fall short. In fact, if you're looking at Arnold's pecs and biceps, believing you can sculpt yours to look like his by following his routine, you're heading down the wrong path. The key to Arnold's success was his drive and ability to focus on what he could control to maximize his chances for success. This is even more apparent in his career changes following his bodybuilding success. No one believed that Arnold Schwarzenegger would become one of Hollywood's biggest box-office stars. He spoke with a funny accent and had a limited range as an actor. His genetics only helped him land roles as barbarians and terminators. Yet, he managed to use his physical abilities as a springboard to a more successful acting career than anyone predicted. No one attributes Arnold's political success to genetics. It was considered improbable, perhaps impossible. Yet, he managed to get elected as governor of the most populous state in America. Who'da thunk? These additional successes Arnold Schwarzenegger achieved were not coded into his DNA. And they didn't naturally stem from his earlier physical successes. Clearly, Arnold had something in addition to genetics that drove him to the pinnacle of success in three disparate fields. And that's the central point I want you to take away from this article. Arnold proved he could succeed in multiple fields. So, why can't you succeed in at least one? The crucial element of success is not genetics: It's tenacity and discipline. Focusing on genetics is a distraction from what you can achieve in addition to your natural-born coding. You can't control your genetic ceiling, so why let it concern you? But you do have full control over the amount of effort and discipline you apply to your success. The key is to dig in. Ignore the naysayers, and work to achieve what you can with your physique or any other aspect of life. In other words, the idea that genetics is a limitation is nothing more than a distraction—or worse, a form of personal sabotage. It gives you permission to slack off your nutrition or training regimens. It gives you permission to accept failures in any other aspects of your life. It gives you permission to accept mediocre results. Arnold's greatest lesson rings loud and clear: Whatever your goals are, you must dig in, believe, and apply every minute of every day to succeeding in whatever you endeavor to do.